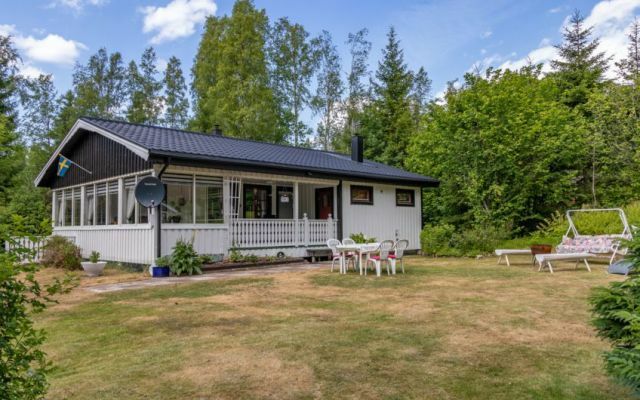 Holiday Home Sweden, Närke, Åtorp: "Fallet"
This well-kept holiday home is situated on an approximately 2,500 sqm plot near Åtorp in the region of Närke. 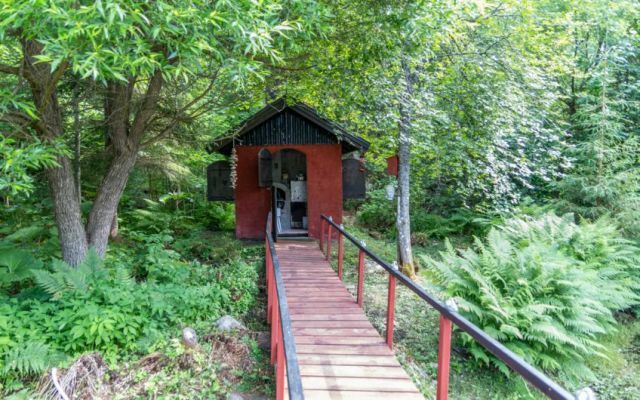 The property is secluded and is transparency protected by many trees and shrubs. 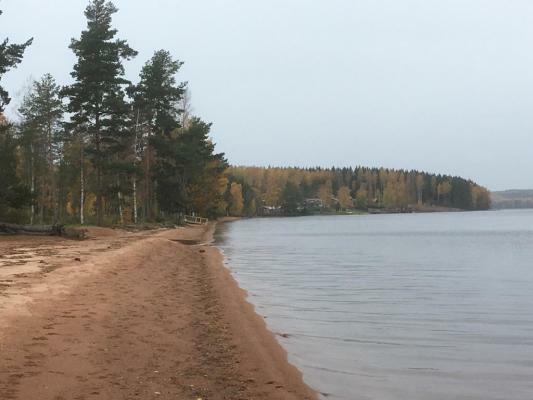 Only about 600 meters from the cottage is the lake "Skagern", where there are fishing and swimming opportunities. 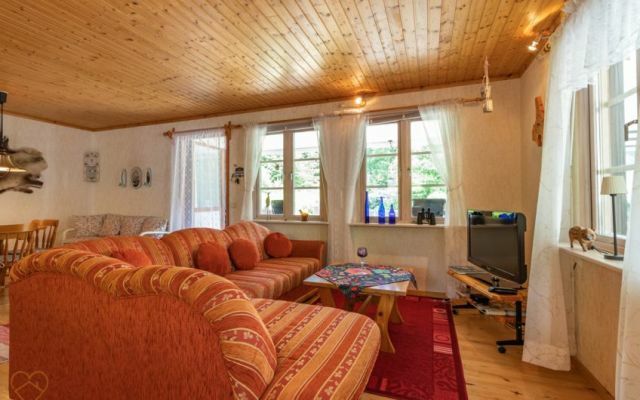 The holiday home is approximately 65 square meters and can accommodate up to four people. Pets are allowed on request. Through a covered terrace you enter the house. There is the large, bright and open living room. 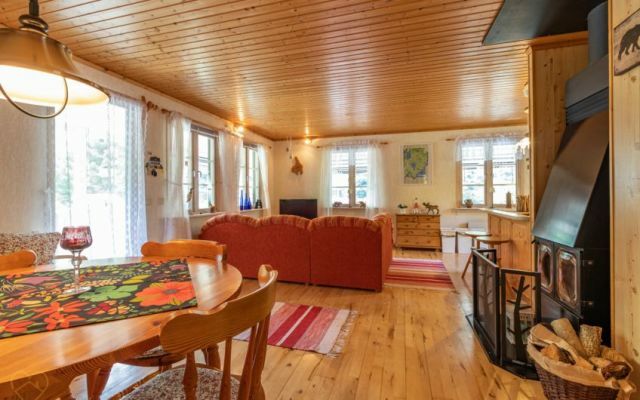 On the right side you will find seating and dining area, just in front of you is the large stove (wood is included!). To the left is a large corner sofa with a TV (German and Swedish programs), connected to the open kitchen. 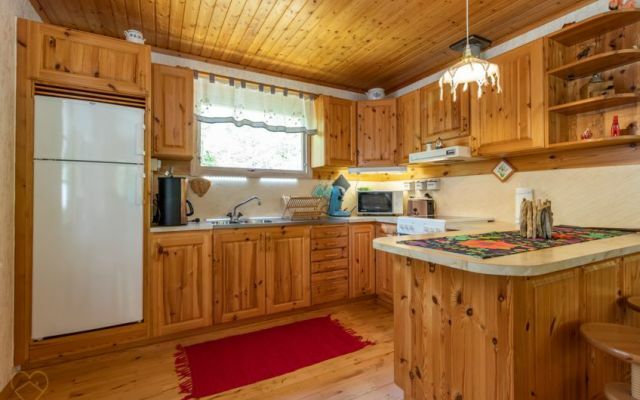 The kitchen is fully equipped, for example with a ceramic stove. In addition, the kitchen has a Senseo coffee maker (pads must be included). The two bedrooms are from the entrance on the right. 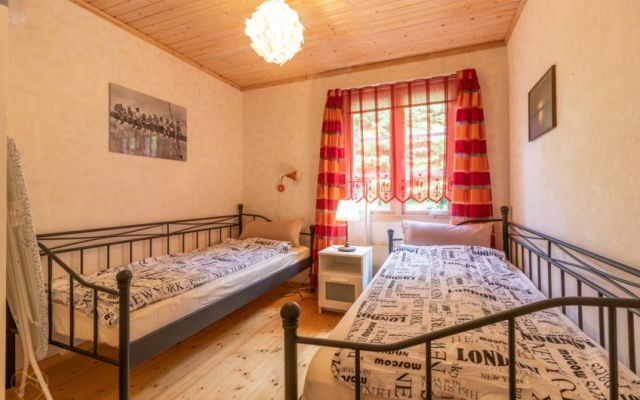 The first bedroom is furnished with a double bed, the second bedroom has two single beds. 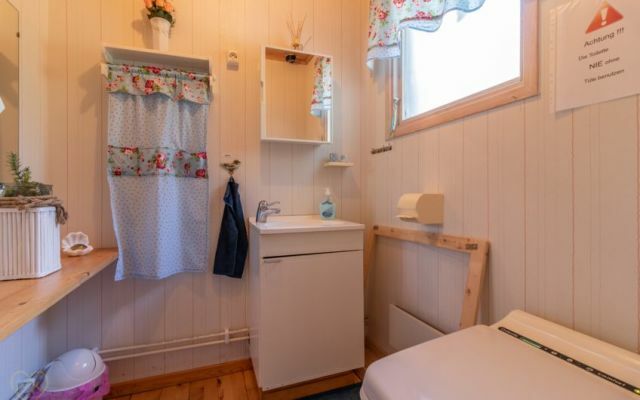 Directly opposite the second bedroom is the toilet. This is a new and modern combustion toilet. 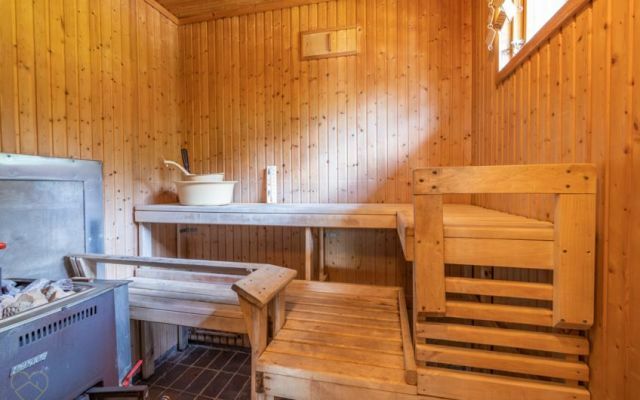 The shower can be found together with the sauna next to the entrance. As already mentioned, there is a terrace under the roof in front of the house. Through this terrace you reach the winter garden with table and chairs, as well as a lounge seating area. Above the seating area's lounge is a heating element, for a little cooler days and evenings. The winter garden is equipped with sliding windows, so that the windows can be opened on hot days. 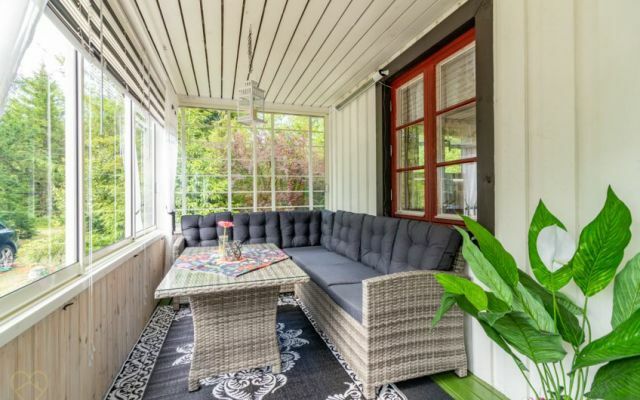 In the garden you will find various seating, sun loungers and a veranda swing. 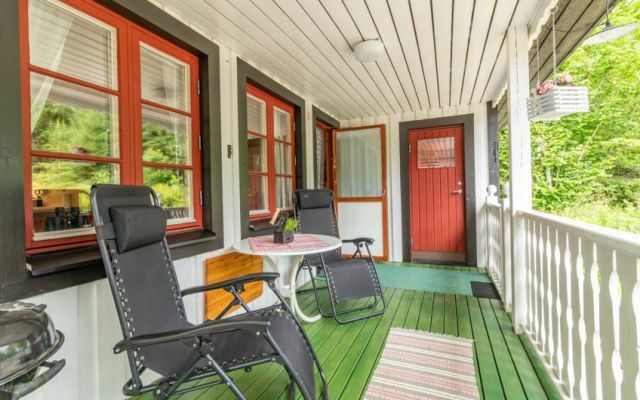 A barbecue house with barbecue and smoke oven and an outbuilding (can be used) is also available on the plot. At the lake "Skagern" at about 600 meters distance there are swimming and fishing opportunities, but no public bathing area. 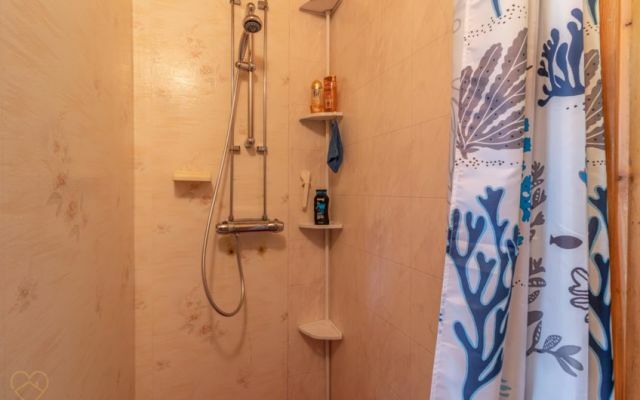 The nearest public bathing area is in "Varbo", about 3 kilometers north. Around the lake "Skagern" leads a good cycle path. Grocery stores, restaurants and cafes are located in Åtorp, about 9 kilometers away. Sweden's largest lake, Vänern, is located about 35 kilometers west. Along the long east coast of the lake there are many bathing areas. 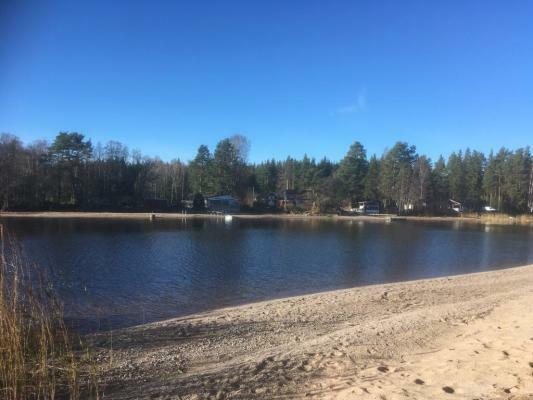 Especially interesting for anglers: Fishing in Vänern is free! 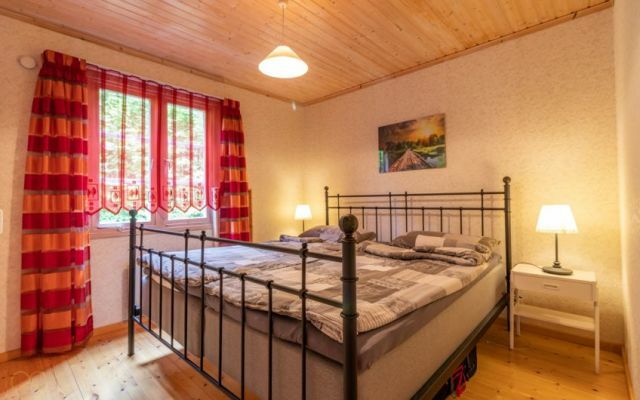 The cities "Kristinehamn" (about 45 minutes by car) and "Karlstadt" (about 1 hour by car) are also located at Vänern and offer good shopping. The same applies in Örebro, about 1 hour's drive away. Närke, which is the smallest province in Svealand and located in the interior of the country borders to Västergötland, Värmland, Västmanland, Södermanland and Östergötland. Almost the entire Närke belongs to the Örebro county whose county seat is also Örebro province's largest city. It is believed that the province was populated as early as after the last Ice Age. If you're interested in history you will here find many ancient monuments such as stone circles and even runstones. Vättern is Närkes largest lake, before Hjälmaren and Skagen. 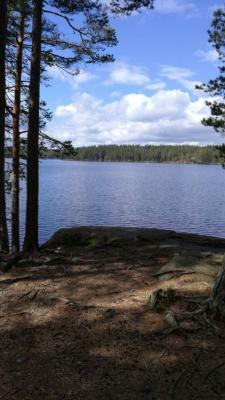 These lakes are not solely located in Närke, but also in neighbouring provinces. Well worth a visit is the beautiful city of Örebro, which is currently the sixth largest in the country with around 110,000 inhabitants. The population is increasing and the forecast says that it will be on place five in 2015 if it continues. Örebro is a popular university city and culturally interesting. Through the city flows the river Svartån and on one island the beautiful Örebro Castle is located. Welcome to Närke and experience both urban and natural experiences!